General terms and conditions: 1. 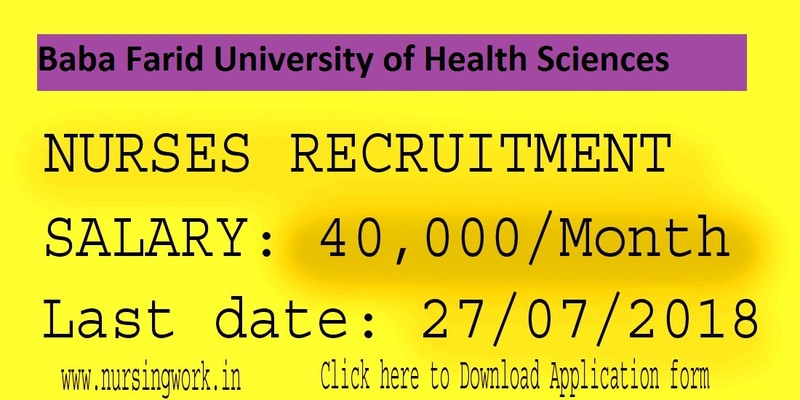 The applicant must enclose demand draft of Non-refundable in favour of The Registrar, Baba Farid University of Health Sciences, Faridkot payable at Faridkot as under: i) For Sr.No. 1 to 6, 8 to 10 & 12 to 15 Rs. 1500/-(Rs 750/- for SC/ST) ii) For Sr.No. 7, 11 & 16 Rs. 500/- (Rs. 250/- for SC/ST) 2. The University has right to increase or decrease the number of posts at any stage without citing any reason or not to fill any or all the posts. recognized hospitals in Govt. set up as well as private set up having at least 100 bedded with facility available for almost all the specialty. 14. The candidate who have already applied against advt. no 07/17 for the post of Lady Medical Officer and Emergency Medical Officer need not apply again, However any additional information i.e qualification, fresh experience certificate etc may be sent to Registrar, BFUHS, Faridkot The post of Deputy Librarian does not exist in service rules, hence withdraw.